After the matching circuits have been optimized (taking typically less than 10 seconds), you can compute a tolerance analysis in a couple of seconds to see the variation of the input impedance and efficiency due to the component tolerances. 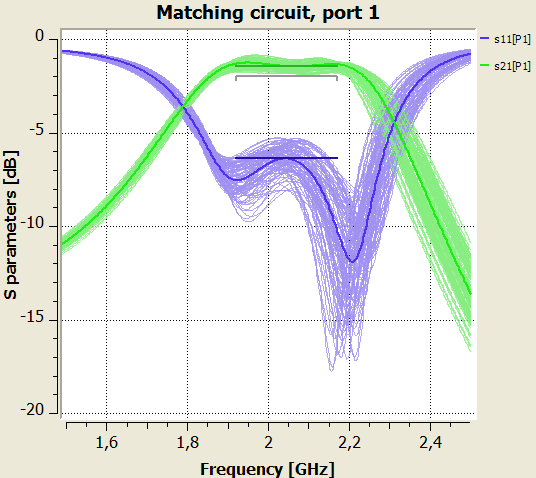 Optimization and analysis of matching circuits using real component models has never before been as fast and easy! The Optenni Lab component library is extremely easy and intuitive to set up and use. To set up the library, select which component series you are interested in and then the models will be downloaded and installed to your computer. Setting up the library takes only a couple of minutes. Initially, we support almost 30 component series from Murata, Taiyo Yuden and Coilcraft, representing more than 2000 different components. When updates to the component models become available, the downloaded component models will be updated automatically. More component series and manufacturers will be added later. Please contact us if your favorite series is missing from our list. We believe that Optenni Lab 1.4 has the simplest and most intuitive component library on the market. Please check it out yourself! The Optenni Lab tolerance analysis supports both generic components as well as components from the component library. The tolerance analysis takes only a couple of seconds. In addition to the variation of the input impedance and efficiency, you also get the yield with respect to an efficiency level and minimum performance over the operation bands. Many of the library components support different tolerance variants (e.g. ±2 or ±5%), having either a relative or absolute component tolerance. In interactive tuning, you can quickly select a different tolerance variant of a component and recompute the tolerance analysis in order to select the most suitable variant for your application. Optenni Ltd wishes you a successful new year 2012.